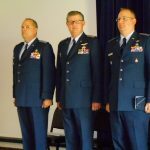 HOUSTON – On April 30, family, friends, and Civil Air Patrol members joined in celebrating Texas Wing, Group IV change of command. The ceremony, emceed by Lt. Col. Alyson White, Group IV deputy commander, was held at Ellington Field. 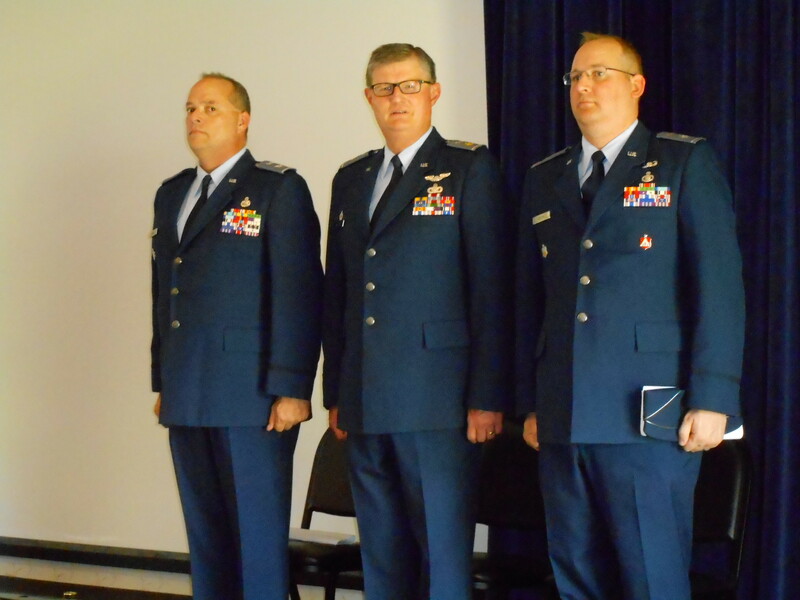 Col. Texas Wing Commander Sean Crandall, Group IV Commander Maj. Ric Walters and Lt. Col. David Ogden stand at attention before the change of command. The atmosphere was one of celebration, honoring Maj. Ric Walters for his outstanding service as Group IV commander for the past four years, and welcoming Lt. Col. David Ogden as the new commander. Ellington Composite Squadron Color Guard posted the colors, followed by Cadet Staff Sgt. Morgan Jones singing our national anthem. Maj. Ric Walters, former commander of Sabre Senior Squadron, did an outstanding job as Group IV commander by melding 14 squadrons, boasting more than 900 members into a well-tuned unit. Emphasis was stressed on emergency services training in this flood and hurricane prone region. After a stellar military career spanning over 24 years of active U.S. Air Force service, including 14 years serving as Special Agent for the Air Force Office of Special Investigations, Walters will take the position as Texas Wing director of homeland security where he will be develop programs to support the wing’s growing mission. Lt. Col. David Ogden steps into the position of Group IV commander. An active member since 2000, he and his wife, Maj. Sherra Ogden have served as a team in both Texas Wing and Group IV positions. Ogden’s emphasis has been on professional development, emergency services to include ground search and rescue school. He has conducted regular training sessions in Squadron Leadership School and Corporate Learning Courses, as well as serving on staff for LoneStar Emergency Services Academy. His vast experience in all phases of Civil Air Patrol preparedness will insure that Group IV will move forward in serving our community and nation. In recent years, Group IV has played an active role in joint training exercises with the Air National Guard, Houston/Galveston Office of Emergency Management, local fire and sheriff departments and U.S. Coast Guard. Also taking place that evening was U.S. Rep. Randy Weber of the 14th Congressional District of Texas was welcomed by Texas Wing Commander, Col. Sean Crandall, as a new member of the Civil Air Patrol. Weber will be a member of the U.S. Congressional Squadron and awarded the honorary rank of Lt. Col. Members of the U.S. Congress and federally appointed officials are eligible to become Congressional members of CAP.